The Ni'Var is a Vulcan Suurok-class combat cruiser, commanded by Sopek, in service with the Vulcan High Command in the mid-22nd century. In 2151, the Vulcan High Command sent the Ni'Var to transfer Subcommander T'Pol off of the Enterprise and back to Vulcan. This was due to her role in the destruction of the sacred Vulcan monastery of P'Jem. The Ni'Var sent a commando squad to Coridan after T'Pol and Jonathan Archer were captured. The Star Trek: Attack Wing – Ni'Var Vulcan Expansion Pack is part of the seventh wave of expansion packs for Star Trek: Attack Wing. 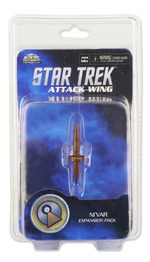 Regala Star Trek Attack Wing : Expansion Pack : Ni'Var Vulcan!